"Ensenore Glenn House, on Southern Central R.R. & West Shore of Owasco Lake, 11 Miles South of Auburn. A Paradise for Summer Visitors, Geo. Clark Propr. P.O. Address Culvers Point." Genesee County Mills, J. G. Cameron, Propr., Manufacturer of choice patent process Flour. Cor. Main & Ellicott Sts., Batavia, N.Y. ; E. L. & G. D. Kenyon, Triple Store, No. 72 Main Street, Batavia, N.Y. ; Turner & Jones, Wholesale & Retailer in Fresh, Salt, and Smoked Meats, Pork, Lard, Hams, Bacon, Head-Cheese, Pork and Bologna Sausage. Nos. 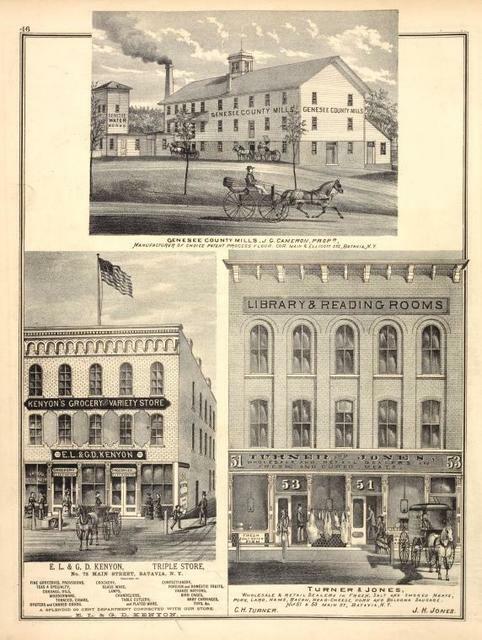 51 & 53 Main St., Batavia, N.Y. C. H. Turner. J. H. Jones. Res. 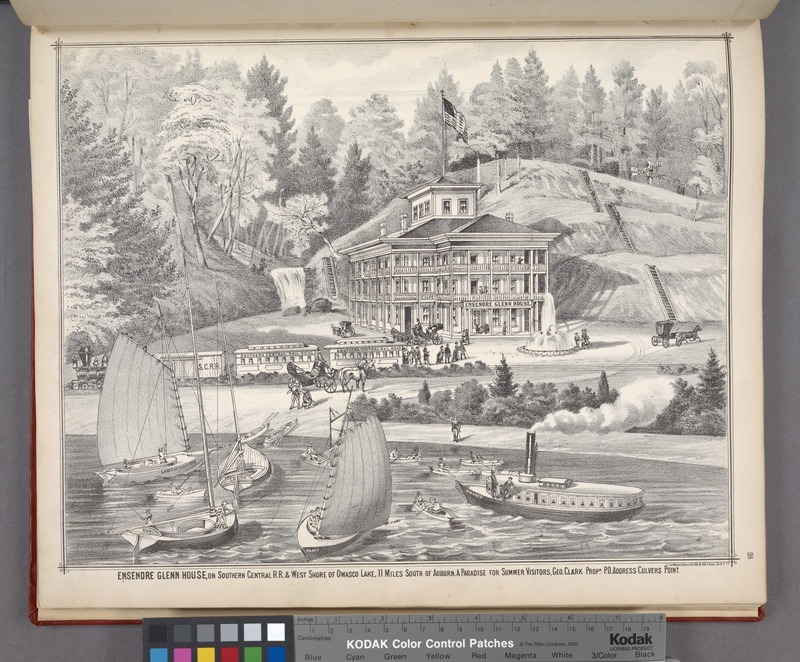 of Dr. David Drysdale, Abbott's Corners, Erie Co., N.Y. ; Custom & Flouring Mills, Hamburg, N.Y., Isaac Long, Propr. Sketched 1879; Res. of Mr.Isaac. ; Residence of L. A. Banks, near Abbott Road Station, Town of Hamburg, N.Y. ; Residence and Meat Market of Andrew Stein, Hamburg, N.Y.
Hotel letter-heads. 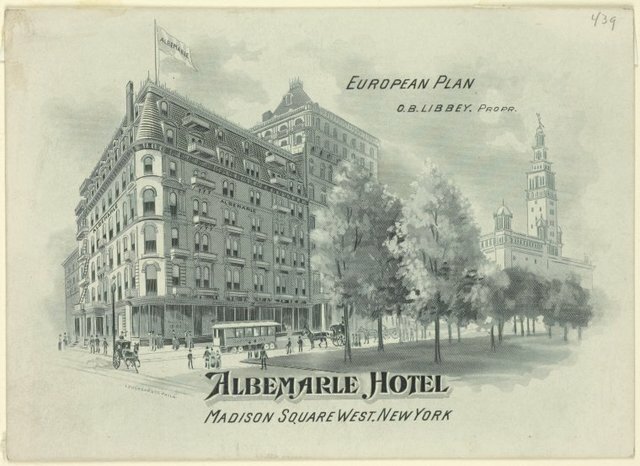 Albemarle Hotel Madison Square West, New York. Above: O. B. Libbey, propr. C.C. 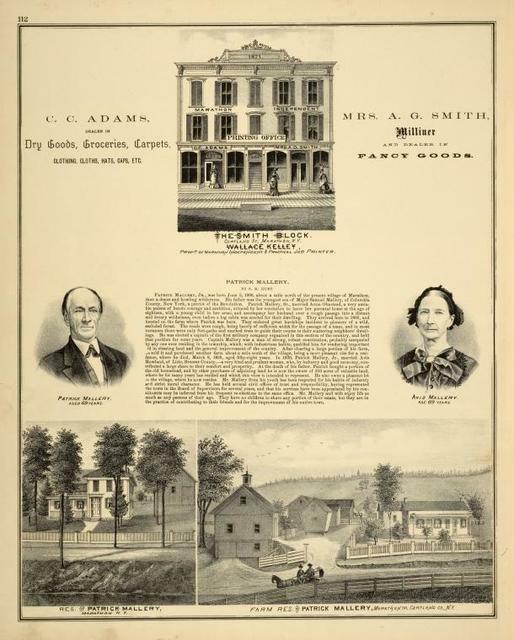 Adams, Dealer in Dry Goods, Groceries, Carpets, Clothing, Cloths, Hats, Caps, Etc. ; The Smith Block. Cortland St., Marathon, N.Y. Wallage Kelley, Propr. of Marathon Independent & Practical Job Printer. ; Mrs. A.G. Smith, Milliner and Dealer in Fancy Goods. ; Patrick Mallery. ; Avis Mallery; Res. of Patrick Mallery, Marathon, N.Y.; Farm Res. of Patrick Mallery, Marathron TP, Cortland Co., N.Y.
"National Hotel, Port Byron, Cayuga, Co. N.Y. W.m H. Galt, Propr. ; E.D. Clapp & Co. Carriage & Saddlery Hardware Manufactory West Genesee St. Auburn, Cayuga Co., N.Y."
Eagle Mills, S. B. Clark Propr. Canton, St. Lawrence Co., N.Y. ; Res. of Hiran Atwater, Norfolk, St. Lawrence Co., N.Y. ; Res. of Otis C. Jillson Esq. Depeyster, St. Lawrence Co., N.Y. ; Res. of G. J. Hall Esq. 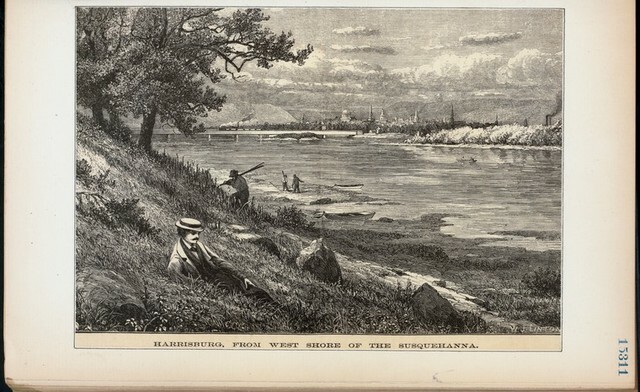 Raymondville, St. Lawrence Co., N.Y.
Harrisburg, from west shore of the Susquehanna. "West Farm Building of David Brinkerhoff ESQ. Looking S.W. on Owasco Lake. ; Building on East Farm; Building on West Farm Looking East. ; Farm Buildings of David Brinkerhoff ESQ., Township Owasco, Cayuga Co., N.Y. "